Clear skies. Low 66F. Winds NE at 5 to 10 mph. Contact The Californian’s Herb Benham at 661-395-7279 or hbenham@bakersfield.com. His column appears on Sundays, Tuesdays and Fridays; the views expressed are his own. 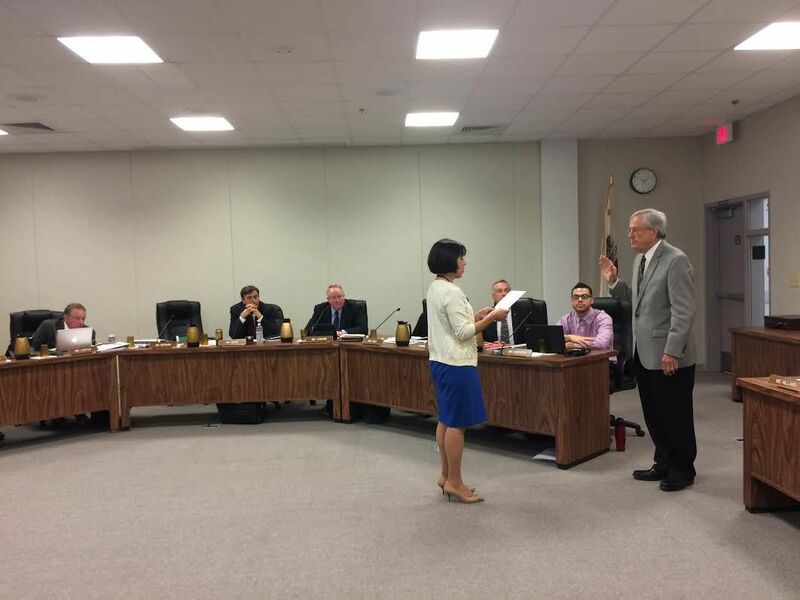 Retired congressman Bill Thomas was sworn in Thursday as a provisional trustee at the Kern Community College District. The house was 95 when I returned from a week in Del Mar. Did I have a sunburn because my face was hot and the air conditioning didn't seem to be doing its job. When your house is 95, your air conditioning almost wants to give up when its facing the gargantuan task of bringing the inside temperature down 15 degrees. Two hours later — 85 degrees. Progress. Jeff Vetter called last night and said his dad Ken, the venerable family man and longtime insurance agent, had shot a hole-in-one the same day. Ken, who is in his late 80s, always says the same thing when you ask him how he's doing, "Herb, I am really blessed." Then, he turns on his 64,000 watt smile. Ten degrees makes all the difference. Seventy one in the morning. A walk, a ride, a swim. Heavenly cool mornings are one of the best features of a Bakersfield summer. Small favors loom large. Branches are cracking, tree are giving up. Don't give up trees, It's only June 26th and the hot and the dry has only just begun. A few days ago, I was walking home on 17th in front of the insurance office which is across from First Pres. A huge, massive, life-ending, car-crushing branch from a sycamore cracked and fell a few feet before its fall was arrested by the branch below. Had it fallen through, it would have taken out a white SUV and a newish white Dodge pickup. I walked inside the office, built on what used to be an auto repair shop, and suggested that the owners of those two vehicles, who turned out to work for the insurance office, move their cars lest they have to exercise their insurance policies that were no doubt close at hand. When it's 82 at 5:30 in the morning, you know you're in it, in at about 110. Extreme heat is its own season and its presence takes over every conversation. For Father's Day, I ordered three seasoned rib eye steaks from Wood Dale. They were insanely good. Cooked over mesquite, that fire was hot, the rib eyes were the best I've ever had. Buy some and have them season them. Sometimes weather changes in the night, but today, a warm breeze first thing in the morning signaled that the cools days with which we've been gifted are coming to an end. We could complain, but it seems unsporting, ungrateful for the coastal weather, Bakersfield style. Everybody is saying the same thing: "Is this really June? Sixty degrees outside? Beautiful weekend behind us. Cool few days in front. This has been a great spring. It's not only cooler but the water in the river makes it feel cooler still. Ate lunch at the Petroleum Club today with a window facing north. If they needed another reason to call the Petroleum Club the Petroleum Club, the spot-on view of the oilfields on the other side of the river, is one more. The river, even 12 floors up, is impressive. In a year like this, we can't get away from the river and we don't want to. It's this blue ribbon of hope flowing through town, one side to the other. Otie Hunter, the CHP officer who wrote James Dean a speeding ticket two hours before the movie star was killed in an accident near Cholame and had no idea who he was, has died. I sat next to Otie at Hodel's a few years ago at a breakfast of retired CHP officers. Funny guy. "To me, he was just another guy who was going too fast," Hunter said. Business address: Warner Bros Burbank. Heat ramping up, here is a secret. Wet your shirt before you go outside. Garden, walk, exercise. I did, before a 15- minute walk to work and the wet shirt, especially the wet shoulders, will keep you cool as the shirt dries. This probably works less well for women. Women who are not interested in drawing a crowd. Women who are satisfied minding their own business. However, men, wet the shirt. Soak that baby. A long summer will seem shorter. I know I may be the last person to have discovered Vallarta Supermarket on Niles, but in case I'm not, you may want to be. After reading a Curious George book to kindergarteners at at Owens School Wednesday, instead of making a left turn back to the paper, I decided to go right on California and search for the truth. California to Mount Vernon to Niles, maybe not your normal flight path, but a flight worth taking. Vallarta, spotless, but not sterile. Six different kinds of ceviche, stacks of warm tortillas, pinatas hanging from the ceiling. Fresh, cold cherries, 99 cents a pound. Pan dulce — sweet fresh Mexican pastry. Rosalvo, mother of a two year old, at the checkout counter. Vallarta — its own kind of truth. My neighbor Rose Sarad became a citizen last week. Canadian to begin with, now she has the best of both worlds. I walked by her house and saw little American flags everywhere. She joins Sally Baker who also became a citizen recently. Sally, is a personal trainer, mother of four, married to Rob and soon to have a married son in Thomas. `We should do half as much in our lifetimes: Saw Bill Thomas at a dinner at Bakersfield College last week honoring people who helped raise half a billion through the Measure J campaign. Every time I see the man, he's thinner, Sharon, his wife was there and she is a sweetheart, and I am reminded how much good Bill has done he's done for Kern County. Almost a billion for the Thomas Road Improvement Program and then helping with the bond measure that will help modernize BC over the next 30 years. The dinner also made me feel good about BC all over again. Talk a force for good. Food for the soul. This is an excerpt from "California, The Land of the Sun," from Mary Austin. Claire Hackett (Leddy) my beloved girlfriend in the second grade at William Penn, sent this to me years ago. "Bakersfield is a heaven of roses. Doubtless there are other things by which the inhabitants would be glad to have it remembered, but this is the item that the traveler in the season carries with away with him. Roses do not die there, they fall apart of their own sweetness, wafts of which envelop the town for miles out on the highway. After nightfall, when each particular attar distills upon the quiescent air, the townspeople walk abroad in the streets and the moon comes up full-orbed across the Temblors at about the level of the clock tower. Overhead and beyond it the sky retains a deep velvety blueness until long past midnight. Traces of colour can be seen sometimes in the zenith when the glimmer along the knife-edge of the Sierras announces the dawn." Not much has changed since this was written in 1914. Food for the soul and the rest of the body too:Is there anything better than the solid pleasure of a visit to the butcher counter at Wood Dale Market? The burnished cleanliness of their floors, the stainless steel cases gleaming and four butchers deep behind the counter. This time a T-bone steak because they'd had a run on ribeyes. Home again, coat both sides with dry rub, cook quickly four minutes a side in cast iron on top of the stove, 20 minutes on a plate covered with foil to let the meat cook some more and juices seep. Then, eat. If you are ailing, this is medicine. Food medicine. This is random, but it's food and food is important. Smart & Final has fresh pineapples for $1.99 a piece and I'm back in. "Back in" because pineapple has been ruined having been served green, mean and hard in every fruit salad and breakfast accomplice. Buy a fresh one, peel off the rough exterior and it's like a 15 minute mini vacation to the tropics. Pineapple has that sweet/tart matrix explosion going simultaneously. More food. Walking to Sequoia during lunch and ran into the chef from the recently opened "Make It Yours," on 18th, passing out menus on the corner of 18th and Chester. Talk about a guy who wants it bad. Tapas, sliders, calamari. Tell me about last weekend. The most perfect weather. We may pay for it, we will pay for it, but perfect is worth the price.